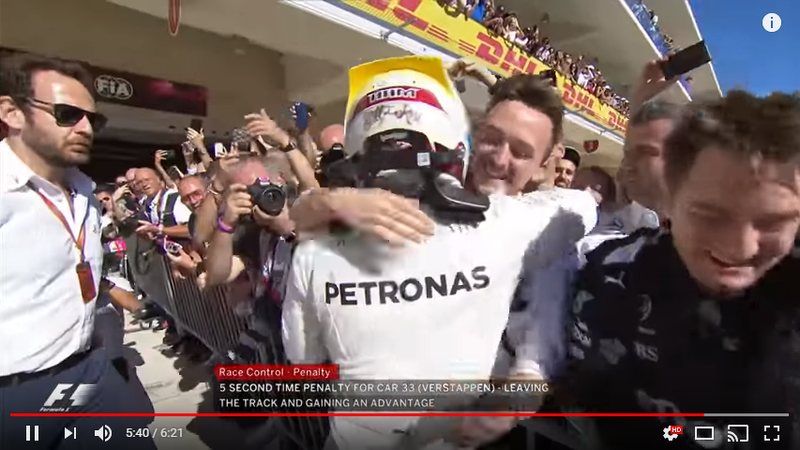 Is there a picture (from the TV footage or just after team shots? ), or we just know that he did? Seems like Maikel has taken my Snake testing machine then! Decent performance by Dan and Glen though, something similar in qualifying wouldn't be too bad! Edited 1 time(s). Last edit at 10/23/2017 10:28AM by truecrysis. Considering my test form this year I might need to hope that team owners aren't allowed into race seats again! Lets hope the qualy goes better! Remember guys, no cutting of corners on the inside! > Weird seeing my teammate in a different car! Yes John... it feld weird for me also, but I did a great job for the first time, I think. Hopefully I can see you also in another car soon. can we see a picture of that event... didn't saw it, but was glad Kimi did get his podium he deserved. he is not a Gentleman driver, far from. Edited 1 time(s). Last edit at 10/23/2017 08:52PM by Stoopid. Nice screenshot, thx Stuart... yes they hug everyone, even Santa Claus if he was there. But very nice for Dan, well done matey... he really got a dream job working for F1 Mercedes Team. I'm a little jealous, I always wanted to do that when I was younger, but I went in the Belgian Air Force instead, and as a Warrant Officer, I also saw quite a bit of the world. I drove sportscars as a hobby at Zolder and Spa-Francorchamps at the time. Now I'm retired (allready 8 years) and I'm only 57years of age... so I care for my Disabled Wife and watch this site, Facebook and still drive GP4 and Sportscars now on PC if I have some sparetime left. Edited 1 time(s). Last edit at 10/23/2017 09:59PM by Brett Sinclair. Next to Poirot, you're my favourite Belgian. When Dan comes to Brazil, will he want to enjoy a beach here in city that I live? I think we can revoke Dan's penalty in the light of recent evidence, namely the fact that he showed in a live feed, broadcasted throughout the world, that he was busy working. Think those are good requirements to ask from somebody that wants a third warning revoked. Might as well congratulate Mr. Paddock for being part of the team that became champions in that other series. Well done sir! Keep up the banter online. GPGSL goes global! Well in Dan! Edited 1 time(s). Last edit at 10/24/2017 01:34PM by SchueyFan. Aren't they concerned you run a team sponsored by Martini ? They should think you're spying for a team with the same sponsor isn't it ? > Next to Poirot, you're my favourite Belgian.